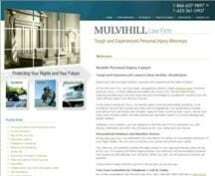 Hello and welcome to Mulvihill Law Firm. The lawyers at our firm provide personal attention and representation. We are tough, experienced attorneys with the resources and knowledge to successfully resolve even the most difficult cases in a quick and efficient manner.